but not really will i did not care for eco complete as the price is very high still did not see really good growth . Soil so now i wate to see if it will actualy grow better . Good luck Carmelita. I'd love to hear some updates as it going. FWIW, the best combination I have used so far, to great success, has been a small layer of 1/2 to 3/4" of Fluorite Onyx Sand, and then a good layer of 1 to 2 inches of Fluorite Black. Nothing else. And it's good (so they say) for the life of the aquarium. Specifically, I like the Fluorite Black versus the Fluorite Black Sand, the black is more like a finely crushed gravel whereas the sand is pretty firm once it settles. But between that substrate combination and good lighting (I find the Finnex 24/7 Planted+ Series to be exceptional in this regard), I've managed to get anything and everything to grow. Looking forward to hearing your updates. 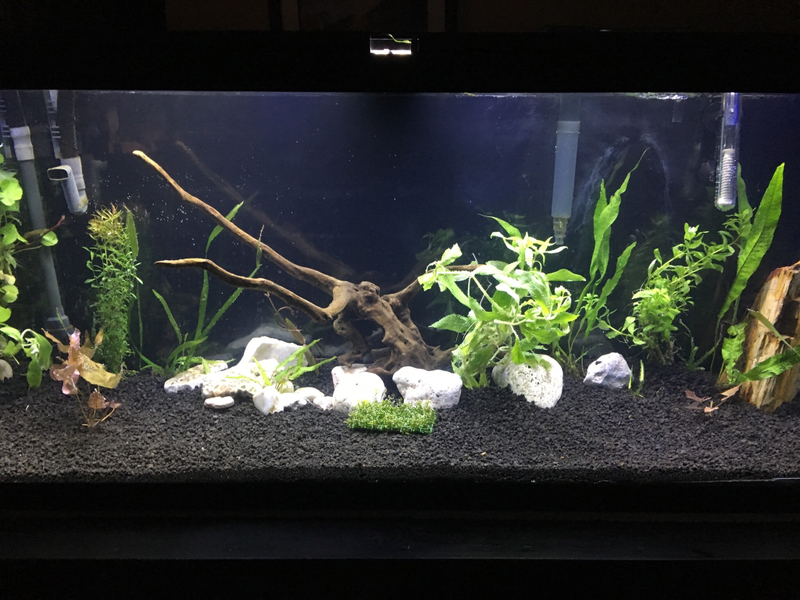 I did do a tank with fluorite at one time it was pretty good but I had the fine sand may still have some somewhere. .
so far everything is good in tank plants are looking fine .hopeing to see some new growth . That's great. I love planted tanks. Of course, I am biased. Heck, I can kick back with a glass of wine in tghe evenings and just watch the plants flow back and forth with the current. It's quite relaxing. What plants are you growing? One of the most rewarding plants I've ever used was actually a fluke. I mistyped it on an order form one day. It's the Ludwigia repens 'Rubin'. I dediced to put one of the pots into my son's tank. It has this beautiful dark green color on the lower leaves than gets this tan to deep red color on the upper leaves/new growth. It's breached the top of the water line several times now in the past couple of months, and i just trim it off and replant the tops to make it even fuller. Between that plant and the staurogyne repens, I can't see me doing any more tanks without either of them. I had a couple of sorted tanks before. They were awesome. Use mineralized soil, and I like to add clay. 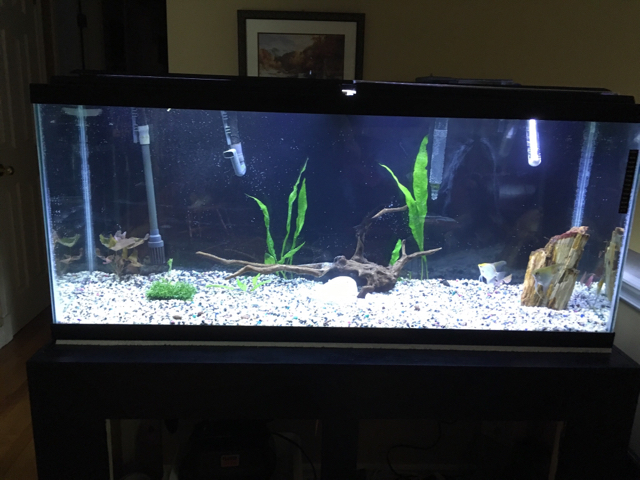 Will my tank is cycled I used soil and florite added some java fern a crips and two angels there is a lot more to do but family showed up With grand kids so got distracted. But I must say it was a nice distraction we had awesome. Week . 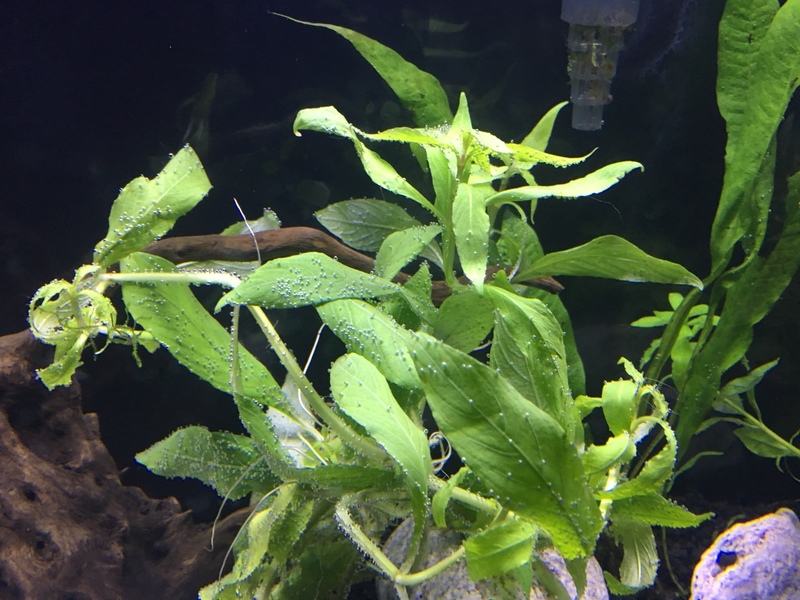 My two angels have paired up and layed eggs on one of the java fern today but promptly ate them all .At least now I know I have a pair . I'm starting to become a real fan of angels. Have you ever seen the leopard angels? Awesome looking fish. I saw pics of some that really looked similar to the pattern of a leopard discus. Yes I have seen them they are awesome but one would have to ship from us that is very costly but I always keep a eye out for different angels . Will big up set today . I was cleaning my tank and noticed bubbles i checked bit further and i noticed lots bubbles when i poked ,air pockets in my dirtied tank So i had to tear it all down and clean out entire tank . I happened to have a full bag eco complete and a bucket of old mixed gravel from a previous tank so after clean i dumped the eco in and then the old gravel not what i planed but it is up and running again. Was to nervous to try. dirt again . Planted few more plants now to see if it will grow . Any one know what this plant is-? The plant is a Hygrophila Polysperma.Low light,low ferts easy to grow.A good low tech plant. Great that’s what I was hopeing a good Easy plant ,I plan to pick up more plants in week or so and some fish, plan to stop in Bedford when I am in city again .